The City of Orlando, located in Orange County, is in the heart of Central Florida. Covering 110 square miles, Metro Orlando is home to more than 2 million people. Orlando is neighbored by several cities, including Winter Garden, Sanford, and Altamonte Springs. Orange County is adjacent to Lake, Seminole, and Osceola counties. The central Florida area is made up of sand hills and lakes. The permeable sands and internal drainage of this region make it the principal recharge area for the Florida aquifer. The soils consist of sand, clay, and organic deposits all conducive to GPR investigations. GeoTek Services provides Ground Penetrating Radar services in the Orlando area for utility locating and concrete scanning, as well as for forensic and archaeological investigations. Call (407) 965-2253 (or click here) to request information on our Ground Penetrating Radar services in the Central Florida region. Certified Utility Locating Instructor on Staff. GeoTek's Technical Staff are certified by UTA as a Certified Professional Utility Locator. 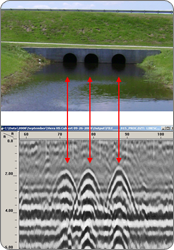 GeoTek Services employs Ground Penetrating Radar best practices and methods specified by ASTM. GeoTek Services, LLC provides Ground Penetrating Radar and Electromagnetic Induction (EMI) services to support your utility locating and structural inspection needs. GeoTek Services will provide your project with a complete underground imaging solution. We offer non-destructive concrete scanning, inspection, and private utility locating services. We also provide expert consulting services.